Tumeric benefits are being recognized as indispensable for antiaging. In the form of curcumin, it has become a popular supplement. The beneficial effect between curcumin and alzheimers has led to multiple curcumin uses, as it is now recognized as a powerful anti-inflammatory substance. What if I told you that one of the most effective anti-inflammatory and antiaging substances came from a common kitchen spice? Say hello to our newest aging fighter called curcumin. 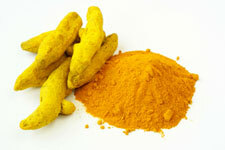 Curcumin is extracted from the Indian spice called tumeric, also referred to as curry spice. It is a orange yellow powder, is used in ethnic cooking, and is also a folk remedy for a list of ills. Curcumin is the principle “curcuminoid” ( a polyphenol compound) of the Indian spice tumeric. The polyphenols give it it’s distinctive yellow color. The benefits come mainly from curcumin as does it’s yellow color. While tumeric is mainly used in cooking, curcumin is used for a variety of health and medicinal applications in it’s supplement form. Protects against lipid peroxidation and DNA damage. When added to curcumin, 20 mg of piperine (extracted from black pepper) increases absorption of curcumin by 2000%! Curry powder, (tumeric) which contains curcumin, is used extensively in India for cooking. Coincidentally India has the lowest rate of alzheimers disease in the world. Research has pointed to a relationship between curcumin and alzheimers. This led researchers to suspect that curry powder because of it’s tumeric curcumin content, protects the brain from alzheimers disease. Even though this is not considered proof, it would seem that the curcumin in tumeric is a powerful anti-inflammatory. Given this evidence, it would be wise to add this popular spice to your diet, if you have a taste for spicy food. Even occasional use of curry powder will provide tumeric benefits, not to mention a more enjoyable meal! Since curcumin is unstable in the stomach, very little is actually absorbed. Supplements try to get around this by using different forms such as nano-particles and delivery in (liposomal) oil based forms. The liposomal and nano particle forms are the cutting edge for curcumin supplements and I will be reviewing them in the coming months, so that I can make a recommendation. Remember that tumeric benefits can be had by using the spice as well as supplemental curcumin. There may be nutritional co-factors that add to the benefits of just taking curcumin alone, so the next time you are in the mood for some spicy food, don’t hold the curry sauce!